If you're looking to grow the number of fans you have on your Facebook page, the fastest way is through paid media. With Facebook advertising, you can target specific countries, cities, genders, ages, and affinities or interests. Facebook's robust targeting capabilities makes it easy for your small business to reach the right audience. Step 1: Navigate to the Create an Ad section and select, "Promote a Page." Promoting your page allows you to connect with more people. Step 2: Next, you'll need to select the locations where your Facebook page promotion will show up. The more places you list, the wider the reach and the more people will see your ad. Think of the next few steps as if you were casting a net. Step 3: Select specific interests based on the type of content you post, the things your users like and the industry keywords that your potential audience might search for. TIP: The more granular you get, the more specific and targeted your ad becomes. Keep terms generic and broad to reach a wide audience. Step 4: Then, select the demographic for your target audience (age and gender). Step 5: Next, set your daily budget and schedule the duration for how long you want your ad to run. 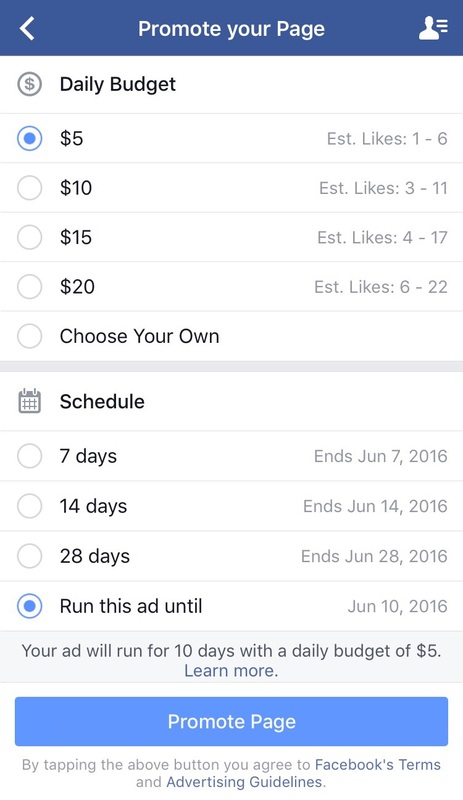 It's important to set a lifetime budget (you can do this under the "Ads Manager" section), especially if you don't want to spend more than you're willing to shell out on paid media. If you know how much you're willing to spend per day, you can select from the various options. Otherwise, take precautions and set a lifetime budget.